Tickets for our annual field trip will be for sale TOMORROW from 10 a.m. – 3 p.m. during the Discover Quail Creek event at the clubhouse. 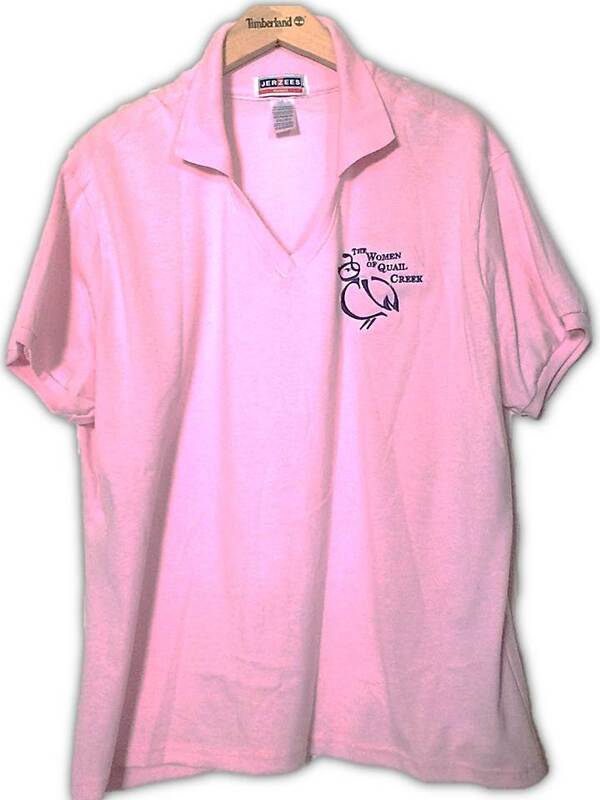 They will also be on sale in the Madera lobby from 10 a.m. – noon on March 12. Cost is $40 for members and $45 for guests. The field trip will take place on TUESDAY, March 31. Busses will leave the Madera parking lot at 9 a.m. and return somewhere between 4 & 4:30 p.m. We will have two stops—the DeGrazia Museum and the Miniatures Time Machine Museum. We will meet together at Trattoria Pina for a Spaghetti Bolognese lunch with a chocolate éclair for dessert. Last day to buy tickets or request a refund if you have found you cannot make it will be March 17. Several years ago, we had Jeannette Maré, founder of Ben’s Bells, speak to our group and several of us went to the Ben’s Bells HQ in Tucson where we painted ceramic pieces that went on to the Ben’s Bells wind chimes. No reservations or artistic ability needed! 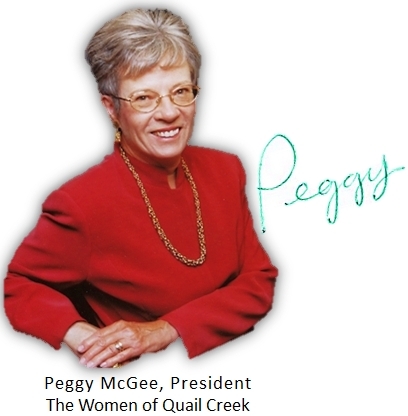 If you have baby items you wish to donate, you may take them to Pam Rodgers’ house at 2640 E Sawyer Road. Keep your eye out for diaper coupons in Sunday’s paper. A new Mom can never have too many diapers and wipes! There are donation boxes at the Anza Athletic Center and the Madera Clubhouse where donations can be dropped. If you have donations for the Moms’ bags, please take them to Laura Colbert at 2040 E Cypress Canyon Dr. Items needed include age appropriate jewelry (remember the moms–to-be are mostly in their 20s); lotions (hand, body, facial); Kleenex mini packs; lip balm; disposable razors; shave cream; hand sanitizer (purse size); emery boards; nail polish; scarves; nail file kits; key chains; compact mirrors; samples (i.e., from Arbonne, Avon, Bath & Body Works). We do have enough Loofahs (scrubbies), watches, rings. Shirts have been ordered but if you find you want one to wear on the field trip on March 31, please let me know ASAP so I can get the order in. The shirts are $18 and come in sizes Small to 2XX. I found they run small but since they are a blend, they do not shrink. Shirts ordered at the January meeting can be picked up at my house at 1908 E Longspur Place at any time. I will be sending emails to all whose shirts have arrived. Those highlighted in green are from Green Valley. There is one female going highlighted in pink. Letters can be turned in to Kay Robinson at 898 Kenneth Drive or left at the Concierge desk. Please note that William M (highlighted in green) is the father-in-law of our 1st Vice President for Membership, Carol Mutter. As a reservist, he was also called up to serve in the Korean War. Since he served in two wars, perhaps we can shower him with letters from our club. Cookbooks will be on sale during the Discover Quail Creek event on March 7. Thanks to all who have volunteered to help on March 7. They will also be on sale from 10 a.m. – noon on March 12 in the lobby. They will make great hostess gifts if you are visiting family and friends this coming summer. 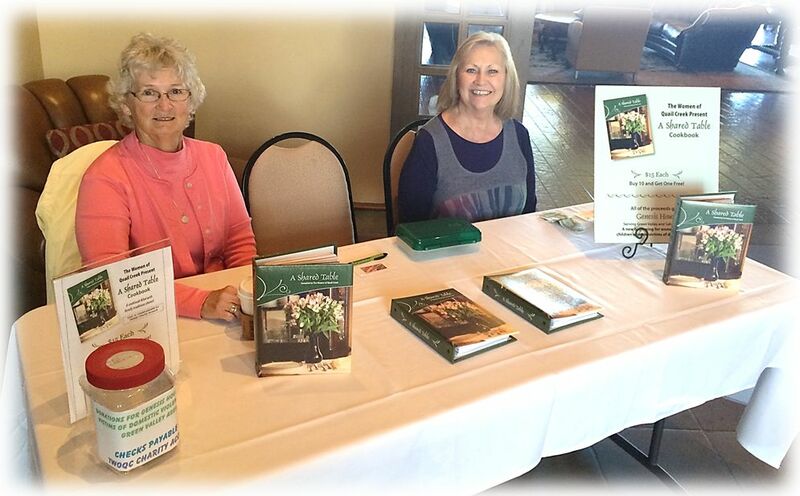 Rena Craine and Noreen Melchert sold cookbooks prior to the February meeting. The next coupon clipping party will be Friday, March 27, at 9 AM at the Connell sisters’ house, 539 Ramos Lane. You will be finished by noon. Please help if you can spare a couple hours. Or in the meantime, stop by their house to see if there are any coupons to be clipped. Coupons to be sent overseas in March should expire February 15 or later. Those for the National Guard should expire April 20 or later. Thanks for all you do to support the club’s causes and make us look really great. We are even listed at the Sales Office as an organization that helps others rather than just as a QC club. You all deserve a big pat on the back for making a difference in the lives of those less fortunate. 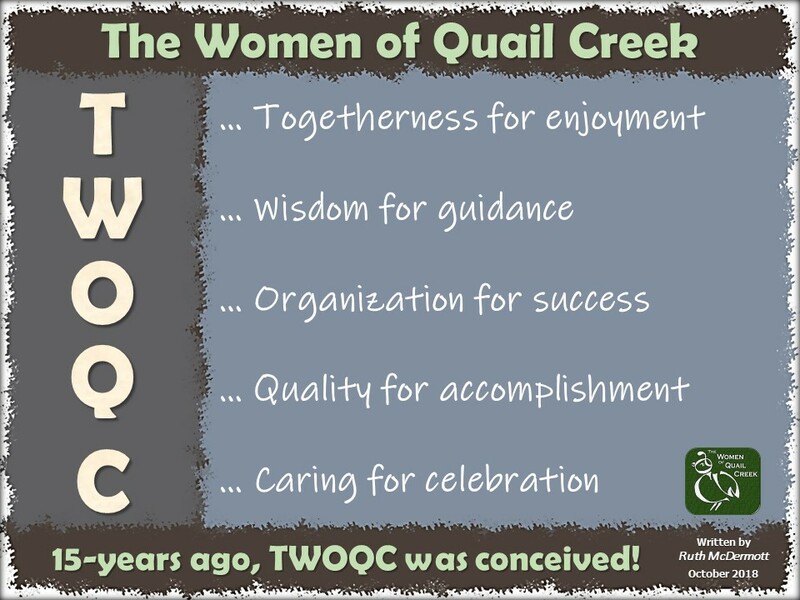 This entry was posted in Announcements and tagged green valley, quail creek country club, the women of quail creek, twoqc. Bookmark the permalink.